It could be argued that Steven Spielberg doesn’t make bad movies. You don’t have to like his films to appreciate what he creates and the legacy that he is responsible for. Unfortunately, even the best directors have their misses and there are none as big as 1941. Saving Private Ryan has already demonstrated that Spielberg knows how to deliver a war epic. He can capture the heart, emotion, impact and realism of conflict but his earliest attempt tried none of that. Instead what Spielberg delivers is a slapstick, mess of movie which takes the war against Hitler and the Japanese and instead chooses Hollywood as it’s location. If that sounds strange enough, it is only the tip of the iceberg. A self-parody of the Jaws opening, which ends with a naked girl atop an emerging submarine, sets the tone and it doesn’t get any better. The story seems to be that the Japanese, three days after bombing Pearl Harbour, are trying to attack Los Angeles and only a few rag-tag, misfit soldiers can stop them. This could have some potential but what Spielberg delivers is a mess. The story is in there somewhere but this is a muddle of set-piece scenes which seem to have some coherence but only a thin thread of plot running through. These include a bizarre dance number, a strange scene involving Christmas trees and a weird finale which tries to bring everything together in a large, explosive, ending. What is even more baffling is that the movie is written by two acclaimed, successful writers. 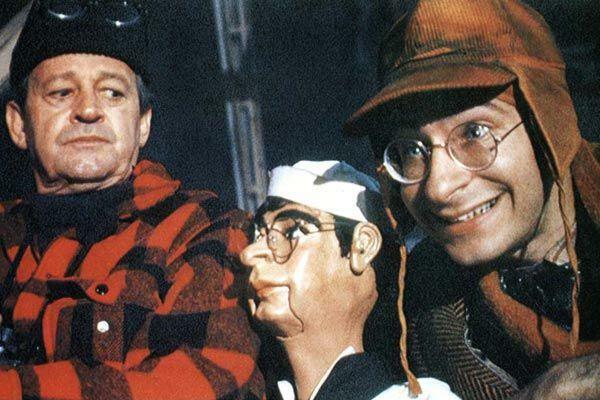 Robert Zemeckis and Bob Gale wrote the Back to the Future trilogy and Who Framed Roger Rabbit to name a few but here they offer a script full of dud one-liners, weird characters and a story which makes no sense. If the script reflects the strange movie, then the cast have nobody but themselves to blame. The comedy talent included in the film is impressive, which makes the experience even more baffling. Dan Aykroyd, John Belushi, Ned Beatty, Christopher Lee, John Candy and this is just scratching the surface. A Steven Spielberg movie with this cast should offer much more than this. The biggest crime of 1941 is the one aspect it shouldn’t falter on and that is comedy. The movie just isn’t funny. It relies on slapstick, anarchy and misunderstanding, all of which have been done much better in many other movies. 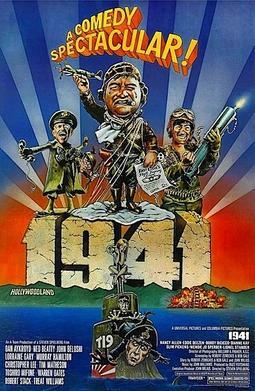 1941 sits in-between Close Encounters of the Third Kind and Raiders of the Lost Ark. Every director is allowed a blip in their career and a misstep and 1941 is definitely that. Spielberg can do war, he just can’t do war-comedy. But can anyone? Overall, 1941 is a rare Spielberg miss. It has a bizarre story, strange characters and scenes which make little sense in isolation, regardless of their place in any kind of story. The cast is great but the characters and script are poor so even Aykroyd and Belushi can’t save this movie.